Professional psychic in Farnham, Surrey,Tricia Monteverde has a passion for spiritual healing and providing an inspiring experience to clients. Being a gifted Clairvoyant London, Surrey and Hampshire are the local counties where Tricia often has events and one to one sessions with her clients. Tricia is able to offer one to one private spiritual healing sessions, group tarot reading and spiritual awareness workshops. If you are looking for spiritual healing in Southampton or a psychic medium in Hampshire, Tricia Monteverde can provide help to reconnect you with a loved one, help you deal with inner pain and support you in dealing with your feelings. Contact Tricia Monteverde for tarot reading in London, Surrey or Hampshire – Learn what her tarot cards can tell you about yourself and your future. 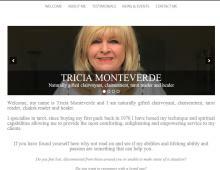 "Tricia is such a gifted medium, I have known her for twenty years and her readings are always enlightening and true. She has helped family and friends too when they have been seeking answers or encouragement. Tricia works from the heart and has continually studied to improve and develop her spiritual and psychic skills." Contact Tricia Monteverde today for Events, One to One or Group Sessions.